What do you do when no thought or provision is made for cyclists on the roadway? If you’re like most people, you’re likely to avoid that road altogether. Awell-known study of Portland, Oregon residents’ feelings about bicycling for transportation indicated that the majority of the public would like to ride a bike if they felt it was safe. The study identified these would-be riders as the “interested, but concerned” segment of the population. These people are interested in riding a bike, but are concerned about getting hit by cars if they ride in traffic. So how many people are we talking about? A whopping 60% of the population. The question is, how do we alleviate their concern? For a very small but highly vocal minority of cyclists, the answer is to train people to be comfortable riding in automobile traffic. But this approach is the opposite of what has been proven to actually help people get on bikes. In the world’s great cycling cities, everybody rides, or knows somebody who rides, because the roads and the laws have been designed to accommodate cyclists, so that “everybody from 8 to 80” feels safe and comfortable riding a bike—without needing special training, and without needing special safety equipment to protect them from cars. The result of taking this approach has been that everybody from 8 to 80 actually does feel safe riding, and therefore everybody from 8 to 80 does ride. And the roads don’t just “feel” safe, they are safe—these are the safest cities in the world for cyclists. The “Enthused and Confident” demographic is an enormous number (7%) by U.S. standards, where the average share for bicycle commuting has been stuck for decades at less than 1%. But Portland’s numbers pale in comparison to great cycling cities like Copenhagen (where 36% of the population commutes by bike) and Amsterdam (where 60% of all trips in the inner city are by bike). In other words, if Portland’s much-vaunted cycling numbers included only those cyclists who are actually fearlessly comfortable riding in automobile traffic without bicycle infrastructure, the number is less than .5% of residents, which is approximately the national average of people who will ride a bike despite the absence of infrastructure. The fact is, most people simply don’t want to take what they perceive to be risks with their lives. Just about everybody wants to come home to their families at the end of the day, and most people have very real concerns about riding in automobile traffic. This fear is a barrier to getting more people on bikes, and brushing it away with recommendations that people learn to ride with traffic does nothing to alleviate that fear. And in fact, over the last 40-plus years, these two very different approaches to helping people feel comfortable riding bikes have been put to the test, with very telling results. Where bicycle infrastructure (including both physical and legal infrastructure) has been implemented, people ride their bikes in high numbers. Where it hasn’t been implemented, very few people feel comfortable riding their bikes. Now, returning to the question “What do you do when no thought or provision is made for cyclists on the roadway,” again, it depends on who you are. If you are a particularly brave, determined person, you may decide to ride anyway. That is what Cherokee Schill did when she began commuting by bike in Jessamine County, Kentucky. And because the roadways had been built with no provision or thought for cyclists, she was forced to choose between riding on a shoulder littered with potholes, rumble strips, gravel, and other assorted surface hazards typical of an automobile-centric roadway system, or taking the lane on a highway with a 55 MPH speed limit. Most people would probably just give up. Cherokee chose to take the lane. But if you are the local prosecutor, you may see things differently. You may decide that riding in the lane is “careless driving” and “failing to keep to the right” and needs to be corrected with law enforcement action. Which is exactly what happened in Jessamine County. Law enforcement officers were directed to cite Cherokee whenever she was encountered taking the lane. But Cherokee continued riding, undeterred. After she racked up 3 citations, the prosecutor went a step further and attempted to obtain a court order banning her from the road. This was an extraordinary measure. Cherokee hadn’t been convicted of anything yet—her court date was months away. It’s inconceivable that a motorist would be hauled into court for a hearing on whether the motorist should be banned from the road, when the motorist hadn’t even been convicted of violating a single law. And yet that is exactly what the prosecutor was seeking to do with a cyclist whose only alleged offense was riding on the roadway istead of the shoulder. Fortunately, the judge who heard the prosecutor’s motion had the good sense and judgment to refrain from issuing the requested ban. There would be no pre-trial court order removing Cherokee from the road; the entire issue of whether she was violating the law would have to be argued at trial. There are two significant sections of this statute which were at issue in Cherokee’s trial, and despite winning his case the prosecutor was on the wrong side of the law on both issues. First, the prosecutor argued that under Kentucky law, slow moving vehicles are required to keep as far to the right as possible. One problem with his argument problem is that Kentucky does not use the words “as far as possible.” It uses the words “as closely as practicable.” And they don’t mean the same thing. In fact, it could be argued that “as far as possible” and “as closely as practicable” are the antithesis of each other. When a law says that cyclists must ride “as closely as practicable to the right,” the law is saying that cyclists must ride as far to the right as can reasonably be accomplished under the circumstances. A key word in that definition is “reasonably.” A cyclist might be able to attempt to ride on the furthest edge of the shoulder, precariously balancing on the furthermost edge of the pavement, attempting to avoid falling off the shoulder into the dirt. That might be “possible,” but it would not be “reasonable.” A cyclist might be able to ride on a shoulder, strewn with glass, gravel, potholes, and rumble strips, darting in and out of traffic to avoid the surface hazards. That might be “possible,” but it would not be reasonable. Instead, what the law requires is what the cyclist can “reasonably” accomplish under the circumstances. But who decides what is “reasonable”? That’s an interesting question. Clearly, the cyclist has to make the call as to what is reasonable and safe. But everybody is different, with differing standards for what is “safe” and “reasonable,” so the cyclist’s judgment is also subject to the “reasonable person” standard. This means that if the legality of the cyclist’s judgment is called into question, the courts are supposed to measure the cyclist’s judgment about what is “safe” and “reasonable” against what a hypothetical “reasonable person” in this community and under these same circumstances would do in this situation (answers to this question don’t get to include a suggestion to “drive a car!”). So, for example, if a “reasonable person” is faced with a question of how far to the right to ride, the question revolves around where the reasonable person would choose to ride—taking the high-speed traffic lane with automobiles? On a shoulder littered with surface hazards? On the fog line? Alternating between good sections of shoulder and the right side of the traffic lane? Ultimately, it is the hypothetical “reasonable person” who decides. And in traffic court, that means it is usually going to be the judge who decides what is “reasonable,” and what is unreasonable. 2) If the shoulder can be reasonably and safely used under the circumstances. And that brings us back to the “reasonable person.” Would the reasonable person ride over rumble strips, potholes, gravel, and broken glass, or would the reasonable person move left, and avoid these hazards? Would the reasonable person move left and take the lane? Or would the reasonable person ride the fog line? Or would the reasonable person alternate between riding usable sections of shoulder (assuming that there are usable sections of shoulder), and the fog line? To some extent, this is theoretical. But it’s also evidence-based. The prosecutor can argue that the shoulder is “usable,” and “safe,” but that argument should be supported by evidence. Otherwise, the prosecutor’s argument is just the opinion of somebody who hasn’t actually attempted to determine if the shoulder is “usable” and “safe.” Likewise, Cherokee Schill can argue that the shoulder is “unusable,” and “unsafe,” but that argument should be supported by evidence as well. I wasn’t in the courtroom, but I’ve seen Cherokee’s videos, and the shoulder doesn’t look usable to me. And just to be clear, when I chatted with Cherokee about her case, I suggested that she ride on the shoulder (before I saw her video). So when I say that the shoulder doesn’t look “usable” to me, I’m not opposed to riding on the shoulder. I’m simply saying that I probably wouldn’t ride this shoulder because it doesn’t look usable. Under this law, “As closely as practicable to the right” doesn’t just mean ride as close to the right as can reasonably be accomplished. It also means riding far enough to the right to allow more swiftly-moving traffic free passage to the left. And that is exactly what Cherokee Schill has been doing. One can argue about whether it was reasonable for Cherokee to take the lane, or to ride further to the right. But nobody can argue that she has impeded free passage to her left. The law doesn’t require Cherokee to allow free passage to swifter traffic in all traffic lanes. It just requires that she allow faster traffic to pass her. If a cyclist is riding at a slower speed than other lawful traffic at that time and place, and if there is a safe and usable shoulder, then the law requires her to use the shoulder. 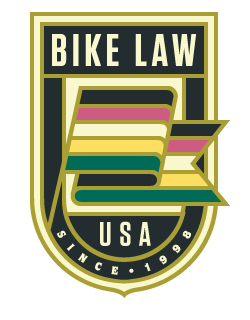 But if there is not a safe and usable shoulder, then the law merely requires that she ride as close as she reasonably can to the edge of the highway, and allow faster traffic to pass to her left. But the condition of the shoulder notwithstanding, Cherokee lost her case. She was convicted on 6 charges, and fined $50 for each of the 6 charges. She says she will appeal. Coming full circle, what is this case really about? The prosecutor will say it’s about safety (And in an irony that may be lost on the prosecutor, so does Cherokee). The vocal minority of advocates who call themselves “bicycle drivers” and who want all cyclists to ride in the lane with automobile traffic will say it’s about a cyclist’s right to the road. This, of course, ignores that there is nuance and context about where we may ride. But ultimately, it’s about the shocking failure of the transportation authorities to give any thought or consideration to accommodating anything other than motorized traffic on their roadways. The only way for Cherokee to get from her home to her job is to take a high-speed highway. There are no quieter, calmer “alternate routes.” There is a shoulder on the highway, but it has been rendered unusable both by design, and by neglect. Where is the protected bicycle lane? Where is the low-speed alternate route? Automobiles are the first and only priority in Jessamine County, and then, when a cyclist attempts to negotiate the existing infrastructure, she is criminalized, harassed by the prosecutor and by local law enforcement, and by Jessamine County motorists, who feel emboldened to use their vehicles as weapons, because law enforcement looks the other way when they do. This isn’t about a failure of Cherokee Schill to obey the law. It’s about a failure of the local and state authorities. If this were a county that cared about cyclists, cyclists like Cherokee would be riding in the protected bike lane, along with thousands of other residents, and nobody would see them as a target for their bullying, lawful and otherwise. But here, she has been given no other choices, and then criminalized for making the only choice left to her. Please be a professional and stop sexist writing practices when reporting stories on women. In other articles by this author, men are referred to once by their full name. Thereafter, they are referred to by their last name only. This practice should follow in any coverage where the cyclist is a woman. You use Schill’s first name name 20 times out of 2595 words. Andrew Woolley’s first name is used 1 time out of 1866 words. Curtis Adams names is used 1 time out of 1220 words. No, it’s about motorists, including in government, not wanting bicyclists on what they perceive to be their roadway. The perceptions of what Portland bicyclists want is irrelevant. She has been using the road for months without any bicycle specific accommodation. If the roads can fit trucks they can fit bicyclists. Thank you Bob! Your whole assessment is spot on. You should point out that Kentucky law is very unusual in this regard. Most (possibly the vast majority) states have a version of UVC §11-301(b) “Upon all roadways any vehicle proceeding at less than the normal speed of traffic at the time and place and under the conditions then existing shall be driven in the righthand lane then available for traffic, or as close as practicable to the righthand curb or edge of the roadway…”. NOTE THE DIFFERENCE BETWEEN THE TERM ‘HIGHWAY’ and “right lane, or edge of roadway” is huge. Shoulder is not part of the roadway, but is part of the highway. Kentucky law seems to be defective in this regard. Thanks for tackling this case. I was asked to try the case at the last minute and granted permission to practice pro hac vice in KY. Cherokee’s original lawyer, Chuck Ellinger, handled all preliminary hearings and lined up two excellent expert witnesses for trial – John Schubert and Tom Armstrong. The prosecutor was permitted to add a 2nd charge on the morning of trial – so 2 charges for each ticket – one for “careless” driving under 189.290 and one for the “far right” law, 189.300. Like many states, the word “highway” is much broader than the word “roadway” under the definitions in KY law. Highway includes the shoulder, and stuff beyond that, while roadway is basically white line to white line. The prosecution argument under 189.300 was that she had to be close to the right boundary of the “highway” which, they argued, means she must use a use-able shoulder if it is available. This flaw in KY law is terribly problematic for KY cyclists as it would arguably apply to any road in KY.
We made many arguments here -that the shoulder was unsafe for a variety of reasons, that she was “allowing more swiftly moving vehicles reasonably free passage to the left” since she was using the right hand lane of 2 lanes going in the same direction. There was an entire lane to the left in which cars could pass. Under the “careful driving” statute, the prosecution focused not on her “careful driving” but on the 2nd half of the sentence which requires one to operate their vehicle “&with regard for the SAFETY and CONVENIENCE of pedestrians and other vehicles upon the highway” – Here the judge was more swayed by the video of cars rapidly approaching at 55mph and then slamming on brakes when they came up on Cherokee. There was never an argument that she did ANYTHING careless except ride a bike at 15 mph on a 55 mph road. That was it. She rode with lights on at all times. She used a high viz vest. She rode anywhere from the right tire track to the left. And because I don’t know Andrew Woolley or Curtis Adams, I referred to them in a more formal way. The fears and desires expressed by Portland residents in the study aren’t just limited to Portland residents, they are universal. That is why we see large numbers of cyclists in cities that build what people say they want, and low numbers of cyclists where cities cater exclusively to cars. If the roads can fit trucks, they can fit bicycles. But most people won’t want to ride on those roads. So, does this set an unfortunate precedent? Or does local like this not matter for others in KY? The Portland study cited was an idea created by a group of PDX employees and citizens, led by Roger Geller of Portland Bureau of Transportation #pbot several years ago. It NOT a study conducted among cyclists themselves, but more of a focus group decision. Once the types were established, all it took was promoting the idea among other cities and transportation groups. While there is some substance to the results, IMHO, this “study” has done more harm than good in all aspects of bicycling activities. If the county cared about cyclists, they would seek to educate motorists about cyclists’ rights to use public roads, and perhaps add some youth cycling education in public schools. Slapping down poorly-designed infrastructure with “manufactured conflicts” is not the answer. Bicycle education is the answer. With proper education, ANYONE can cycle anywhere they need to go, not just the “strong and fearless”. Check out some of the testimonies on the Cycling Savvy website, such as this one: http://cyclingsavvy.org/2012/05/couch-potato-to-savvy-cyclist-in-4-0-months/ You might be surprised. Regardless, the past 40 years have proven that infrastructure, and not “education,” is what gets people on bikes. With infrastructure, people don’t need special training from the high priests of VC to learn how to overcome their fear. They can just ride in safety and comfort, which is exactly what they want. The numbers prove it. We’re just starting to experiment with effective education. Most cyclists, let alone non-cyclists, remain unaware of the safety, practical and comfort benefits of using the full lane by default, and continue to believe the road edge is where they long. Bikes May Use Full Lane signs, sharrows, CyclingSavvy and a variety of efforts on social media are just starting to change this, but we have a long way to go. Will you help us? The language used to cast Ms. Schill as a “fearless” outlier in this article marginalizes her for using the roadway and undermines the defense of her road rights. How can one effectively defend the rights of competent, dedicated cyclists who are doing the best they can with the only roads they have when one implies that they are weird, perhaps crazy, for doing so? It’s very disappointing that a supposedly pro-cyclist lawyer can “like” that Copenhagenize web page – an article that uses the term “secret sect” for those of us who ride according to existing traffic law, using our legal rights to the road. As a beginner in the 1970s, I fantasized about separate bike facilities everywhere. Fortunately, instead of waiting for bike trails, bike lanes, “protected” cycletracks and other oddities, I learned to take my lawful place on the road. I learned vehicular cycling, and I’m extremely glad I did. Had I waited, I’d still be waiting. Instead, I’ve had over 40 years of wonderful recreational and utility cycling with family and friends, in over a dozen countries. I certainly hope the segregation fans and the lawyers among them don’t trade our rights to the road for crazy… or, um, “innovative” segregated facilities. Where and when has education been “put to the test” as an approach to help people feel comfortable riding bikes? I know of no education ever tried on as large a scale as has been done with bicycle infrastructure. Furthermore, bicycle infrastructure does not make everybody from 8 to 80 feel safe riding. It makes riding very uncomfortable for many of us who are comfortable on regular roads. Also, despite the many miles of bike infrastructure in Portland, 60% of its residents are still uncomfortable riding bikes. An eight foot paved shoulder on a 55 mph divided highway is IN NO WAY poorly designed transportation infrastructure. If this were a designated bike route with regular sweeping of the shoulder, I doubt- i sincerely doubt- any of the commentators, the defendant, or the any but the most addled, ardent VC would choose the travel lane except when necessary. This is a big fail on the part of the defendant and she should not appeal this, for its potential damage to cyclists right to control traffic lanes alongside shoulders in Kentucky. This needs legislative redress and a policy of highway shoulder sweeping on bike routes in Kentucky or along highways with no reasonable alternate route. Rick – you should continue to be a professional, regardless. OR, you should acknowledge your relationship. Not doing so is also unprofessional. Perhaps you could make an exception and edit to add that you have a relationship with Schill and that you are referring to her by her first name because you do. Doing otherwise exacerbates our already sexist social institutions. The numbers also show that a HUGE majority of crashes and deaths (not including blatant disregard for traffic movement like riding the wrong way) occur at intersections where the cyclist was not visible, or the cyclist was riding in the bike lane, or on the shoulder, or at the road edge. What most infrastructure does is lend the PERCEPTION of increased safety, when the reality is that there is no such increase, or in some cases the safety is actually worse. Just look at the 2-way cycle tracks installed in Seattle, where there have already been a number of crashes and even deaths just in recent weeks. Look at all the crashes and deaths, some quite recent, of cyclists being doored while riding in a door zone bike lane. Crashes and deaths where a cyclist pops out from behind a row of parked cars only to be dragged underneath a turning truck, where most likely both cyclist and trucker had a green light. Education is what is needed. All of those things I mentioned above are manufactured conflicts. I challenge you to find me one report of a cyclist involved in a crash, who was safely and predictably controlling the right-hand lane of the road, in which the crash could have been avoided by using a different style of riding.